Put your customized logo on our wide selection of golf watches for your next golf tournament, event, outing or promotion. 4. Your golf bags will be produced and shipped followed by a tracking number sent by email. Color Imprinted Golfers Carabiner Clip Watch - Golf Tournament Gifts..
Advertising Special Golf Watch With Red Light - Golf Tournament Gifts.. Custom Logo Pocket watch with belt clip & compass. 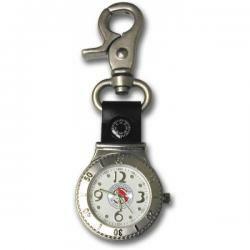 Celebrate your next tournament or outdoor event with this unisex clip on watch. This unique timepiece is designed with matt finish metal case with raised bezel crafted with Arabic numerals, genui.. Custom Logo T Link Golf Watch. TLink is a lightweight Bluetooth Device that pairs with your smartphone to give you accurate front, middle, and back yardages to the green. It is also works as a pedometer, tracking your steps, calories, and distance wa.. Custom Logo Unisex Clipper Watch W/ Pink Strap. The Clipper watch features a matte silver-tone finish case, lobster claw clip with a pink nylon strap, and a white dial with easy to read arabic hour markers. Water resistant to 100' and packaged in a t.. Custom Logo Unisex Quality Leather Strap Watch With Golf Dimple Dial. Golf club hands. Golf dimple dial. Unisex watch. This popular dress watch features a chrome silver tone metal watch case, and a Japanese quartz movement. Choice of black or brown l.. Customized Clip On Golf Watch - Golf Tournament Gifts..
Engraved Golf Watch and Divot Repair Tool - Golf Tournament Gifts..
Executive Golf Outing Stainless Steel Watch - Golf Tournament Gifts.. Golf Outing Watches with a Blue Light - Golf Tournament Gifts..
Golfers Customized Sport Watches - Golf Tournament Gifts..
Laser Etched Golf Carabiner Watch - Golf Tournament Gifts..
Logoed Leather Watch Fob - Golf Tournament Gifts..
Marketing Logo Golf Ball Watch - Golf Tournament Gifts.. Silk Screen Silver Golf Pocket Watches - Golf Tournament Gifts..